Mobile Virtual Network Operators (MVNOs) resell mobile airtime, messaging and data services from one of the major operators, often at a lower price than the operator itself. Some well known MVNOs include TracFone and Straight Talk. Although Verizon is the second largest US mobile operator there are relatively few Verizon MVNOs. I don't know why that's the case. Perhaps Verizon has higher requirements for MVNOs or less attractive wholesale rates. Although they are few in number, several of the Verizon MVNOs do offer some very good deals. Here are brief descriptions of Verizon prepaid and all the notable Verizon MVNOs. Verizon Wireless has over 137 million subscribers including 5.7 million prepaid customers. Verizon's own prepaid plans are priced somewhat higher than comparable plans from Verizon MVNOs. In return for paying more, customers get 24/7 phone support, access to support at Verizon stores and the availability of attractively priced shrink wrapped prepaid phones at big box stores. Off network roaming is available at 20¢/minute. LTE is available and tethering is allowed on Verizon's smartphone plans with the exception of the $80 unlimited data plan. Best Cellular offers plans on all four national networks, including Verizon, Best is notable for having US based 24/7 support. Boom Mobile is a new MVNO from veteran telecom service provider Enhanced Communications Group (ECG). Boom, which launched in July 2016, offers prepaid service on the Verizon network at very competitive prices. Boom Mobile supports hotspot and tethering on iPhones only. ECO mobile has monthly plans that include unlimited domestic and international SMS and varying amounts of data. Expo Mobile has been around since 2013. It offers overpriced monthly plans (not listed here) and affordable PayGo plans, which unfortunately lack rollover. Page Plus Cellular was founded in 1993 making it one of the oldest MVNOs. Page Plus sells non-smartphones and Android phones and allows BYOD (bring your own device) for most Verizon postpaid phones. Page Plus is able to activate Verizon LTE phones (on $12 and higher plans only). Like the other operators listed here, Page Plus provides no support for BYOD devices, the user is responsible for BYOD device programming. Off network voice roaming is available at extra cost. Page Plus was acquired by America Movil's TracFone in January, 2014. Red Pocket Mobile, which was founded in 2006 as an AT&T MVNO, now offers plans on all four national networks. Red Pocket calls their Verizon based product Red Pocket CDMA. It's a "bring your own phone" (BYOP) service that works with clean-ESN (not reported lost or stolen or blacklisted by Verizon for non-payment) Verizon branded phones except phones sold for use with Verizon Prepaid. In addition to its regular plans, Red Pocket offers value priced multi-month plans on eBay and Amazon. Selectel Wireless launched in May, 2013. Selectel's monthly plans are similar to comparably priced plans from PagePlus. Selectel's $10 Flex card can be used to pay for overage on any of the monthly plans. The Flex Card has attractive rares of 5¢/voice minute, 5¢/SMS and 5¢/MB of data and is unusual in that the funds on it never expire. Selectel supports BYOP of non-prepaid, clean-ESN, Verizon branded phones only. Straight Talk , NET10 , Total Wireless. Page Plus Cellular and TracFone are US brands of Mexico based América Móvil, the fourth largest mobile operator in the world and the largest US MVNO with over 22 million users. BYOP is available for all postpaid Verizon phones except BlackBerrys. US Mobile launched in 2014 as a T-Mobile MVNO. Verizon service was added in October, 2017. Both build you own "Custom Plans and plans with unlimited data are available. The unlimited data plans are available in three speed classes, 1 mbps, 5 mbps and full speed. Off network roaming is included at no extra cost on the TracFone and NET10 pay as you go feature phone plans but is not available on Net10, Total Wireless or Straight Talk monthly plans or with smartphones or BYOP devices on TracFone. América Móvil does not allow hotspot or tethering on any plan. Here's a table comparing Verizon's own prepaid monthly plans with those of the Verizon MVNOs that offer monthly or yearly plans . Verizon Smartphone Plan $75 none unlimited unlimited unlimited unlimited 10 Hotspot throttled to 600kbps. 1 Selectel MMS consumes data and is only available if data allowance is not exhausted. 2 Selectel overage - $10 Flex Card can be used to add additional data, minutes or texts to any plan except the $20 or $100 plans at the rate of 5¢ per minute, message or MB of data. The Flex Card balance never expires. 4 Data speeds throttled to 128 Kbps after the high speed (HS) data allotment is used up. Unused high speed data "Carryover Data" rolls over to the next plan month. Carryover data expires after 30 days. All video streaming throttled to deliver 480p quality. Prepaid data prioritized below postpaid data when network is congested. Hotspot allowed. 5 Selectel charges $15 to activate its own phones and $30 to activate customer's BYOD phones. Some Selectel dealers offer free activations. 6 Boom Mobile add-on data: $10/1 GB, $14/2 GB, $30/5 GB. Data add-ons roll over for up to 90 days. Unlimited 128 Kbps throttled data is also available for $5/month. 10 All video streaming throttled to deliver 480p quality. Prepaid data prioritized below postpaid data when network is congested. 11 ROK Mobile $50 unlimited plan: data speeds nay be slowed after 20 GB, video streams at 480p. 12 US Mobile unlimited plans subject to deprioritization after: Standard 12 GB, Fast plans 14 GB, Ludicrous plans 16 GB. Most of the Verizon MVNOs offer pay as you go plans. The table below compares them with Verizon's own pay as you go plans. 1 Page Plus charges a 50¢/month fee on the Standard Plan and does not allow LTE capable phones on this plan. Updated June 27, 2018 - LTE phones now allowed on Page Plus PayGo. What is the definition of a "Verizon prepaid phone"? Is it only phones explicitly branded as Verizon Prepaid, such as the cheap feature phones found in blister packs at Walmart, or is it ANY Verizon phone purchased and activated on a prepaid account, such as the slightly discounted high-end Android phones sold at Verizon stores? I don't want to buy a $550 phone at Verizon and find out it won't work on Page Plus! A Verizon prepaid phone is any phone labeled and marketed specifically for prepaid use. The most expensive Verizon prepaid phone is currently the $430.99 HTC Rhyme Prepaid so your $550 phone should be OK. Page Plus is also unable to activate any phone that was last used on a Verizon prepaid plan. These phones can be cleared for Page Plus activation by temporarily swapping them on to a post paid Verizon account. The latin phrase is caveat emptor. If you plan to spend as much as $550 for a phone, then you really need to perform your own due diligence. As a general comment, prepaid handsets purchased in big box stores will not work on Page Plus based on the numerous posts on Kitty Wireless homepage and forums. The good news is the most expensive Verizon labeled prepaid smartphone found at Walmart is the Samsung Illusion and retails under $100. One more thing. Page Plus currently supports 3G phones. If you want the latest 4G LTE phones, then you are S.O.L. If I am not mistaken, the Droid X2 has the largest screen for a 3G smartphone that works on Page Plus. Also, iPhones are not officially supported on Page Plus. Based on the aforementioned facts, I passed on Page Plus and might get an iPhone 5 from Straight Talk for $45 a month. You can check the ESN of a Verizon phone before buying it to activate on Pageplus. I would be real careful about considering Straight Talk. Here are the significant downsides of dealing with them: their customer service is in Manila (Phillipines) and there are many reports of being double charged and having service shut off without any given reason. This is too much of a risk to pay a lot of money for an iPhone only to have it cut off - especially because I'll bet that the Straight Talk version of the iPhone is crippled to work for Straight Talk only. iPhones activate just fine on Page Plus. You're better off buying a Verizon iPhone 4 or 4S on Amazon with a clean/clear ESN and activating on Page Plus. This is what I've done. I've been using an iPhone on Page Plus since July 2012 without any problem. Anonymous, Page Plus only supports the handful of phones they sell. They allow any clean-ESN, non--Verizon prepaid phone to be activated including LTE phones. The problem with LTE phones is programming them which is difficult and with at least one model, the Galaxy Nexus impossible. The LTE programming issue effects all Verizon MVNOs not just Page Plus. @Yeswap -- I apologize for not being clear. You can't have the latest 4G LTE phones, the one with big displays with the fastest processors along with bells and whistles while running 4G speeds on Page Plus. And, as you correctly pointed out, the average user is not a programmer and instead just want a buy and then proceed to use the phone. So to be clear, you will end up with an expensive LTE 4G phone running on 3G and then ask yourself why perform the Chinese Fire Drill? @paleomatty, I am happy you still get your iPhone on Page Plus. For every one success story about the iPhone on Page Plus, I read about two failures. Again, as I stated earlier iPhones are not OFFICIALLY supported by Page Plus. Going to Straight Talk is a personal choice. I can get the iPhone 4S or 4 with Verzion, but it will cost me at least $60 a month (or cost me as low as $30 a month with VM). I prefer to get the latest iPhone 5 and pay $45. I am not a talker nor send texts, and I don't play on using much data on the phone. But, I really want to replace my aging iPod Touch 4G and my current Android device (currently $25 a month with VM) with an iPhone. For me, the iPhone 5 would replace two devices with one and I get a better network at a cost of $45 a month. TalkForGood's site says: "Tethering is included with the Smart Plan." Thanks for the updates, CellGuru is a reliable source and I found the reference to tethering being allowed on the Talk For Good site. I've corrected the post. I trust CellGuru but I just took a look at Talk For Good's coverage map and it's clearly Verizon native network only. Note the big rectangular area of no coverage in the middle of Wisconsin or blob no coverage just North of Nashville TN. These a extra cost roaming on Verizon prepaid and Page Plus. I also spoke to Talk For Good's customer support who told me that there is no roaming. Perhaps the map was updated recently. I have straight talk and just learned it really isn't unlimited everything. If you go over a certain amount they will turn it off, for example, apparently I used the internet too much and they shut it off until I the next cycle. Also, their fine print says you can't download music, or videos and there are certain other things they don't want you to do or you will be kicked off the plan. This is why I am looking for a new company. I suggest you footnote the 50c/month fee on the Pageplus standard Pay-Go plan. Great reviews. I've seen Verizon & T-Mobile recently. How about AT&T & it's MVNOs. Nice write up Yeswap. I followed you on yeswap many years ago and came across this site when I switched to prepaid recently. I can't believe how much money I'm saving with prepaid now. More people would save so much more if they overcame the "prepaid stigma." Nice work you do. From what I have read, Straight Talk does not support LTE with the Verizon iPhone. To go fast, wouldn't it be better to buy an unlocked iPhone 5 and use it on AT&T or Tmobile "4G?" As long as you have their coverage, you will run a lot faster than Verizon 3G. Seems like this would be worth an extra $5/month to get about the same gb data that Straight Talk allows. If you don't like your MVNO you can switch. Don't you have to flash or hack the Straight Talk iPhone to use it elsewhere? Alternately, is the Straight Talk sim slot unlocked like the real Verizon iPhone? Then you could use an ATT or Tmob sim. I realize that LTE will not work with the alternate method. then the ATT or Tmob / MVNO sims will work. I prefer the unlocked GSM model, so I can use ATT or Tmobile LTE once it is available without a contract. Yes, AT&T or T-Mobile HSPA+ (in refarmed 1900 Mhz areas only) are capable of significantly higher data speeds than Verizon EV-DO. The secret to activating an iPhone on Page Plus is simply not to tell them what device it is. Sure, they are able to tell what the device is based on ESN but if you don't raise the subject, I'll bet it works more often. So Next G Mobile has access to Verizon's Pre and Post Paid networks at no additional cost? If this is true, very cool! The Next G website mentions under Pay Go details and Data Add On details that data requires a smartphone. I cannot find your Pay Go Note 2 restriction that says Pay Go is not available on smartphones on their website. The Talk4Good website is completely reorganized. It is very easy to understand and compare plans now. Can I activate a TalkForGood account with a Sprint device if I call them? Their activation site is down and not working. I only want to activate an account and get a number to port, I don't need any functionality. Is this possible? I would like to do this too. I tried two Sprint phones on Pageplus, since I have their MSL. ESNs are OK, Pageplus activates them, and I program them manually but cannot make a call. I do not know how to manually update the PRL, which may be the problem. The Sprint phones will not auto-program on Verizon to do this. Any ideas that do not involve using phone software? Page Plus has the wrong MEID or ESN. If the phone has an MEID, (most phones made in the last 5 years do), use the MEID not the ESN. Never use a pESN. Wrong MDN and/or MIN entered in the phone or the phone didn't save the MDN and MIN. No call credit on the account. If you activated directly through Page Plus you do nnot receive any intial credit and will need to add some to make a call. Thanks. I will try again. I turned on roaming after programming the phone. I have call credit on the line. Now I can make calls, but Pageplus requires me to enter the dialed number a second time, so I must be roaming on Sprint. I guess Pageplus will charge me the 29c/min roaming fee on all calls unless I can manually change the PRL? Pageplus is charging me 29c/minute for outgoing and incoming calls. Their call records list each of my calls twice now, but they only charge me once. Yes you are roaming. I though your goal was just to get a local number to port to a different operator. Now that you are active on Page Plus you should be able to port. If you want to use the phone on Page Plus without roaming you probably need to load a Verizon PRL. If you can't load a PRL, some phones have a menu option to manually select the network, either a list of available networks or a choice of Automatic A or Automatic B. One of those might get you Verizon. Thanks again. My K1m has an option for Roaming Only; I will try that. None of my Sanyo phones give me those other options. My Sprint/Boost/Ptel Moto K1m is now working fine on Pageplus, using your tip to force Roaming Only. The screen says Digital Roaming, and I must OK the call "at roaming rates" every time, but Pageplus is only charging me their regular rate. One less phone to recycle after Ptel closes Sprint service this summer. Next G has an option to add 250mb of data for $10 to the $50 and $60 plans. The shorter pagepluscellular.com version used to work the same with or without the leading "www." which is the way it should be for searcg engine optimization. The recent PagePlus redesign seems to have has broken the http://pagepluscellular.com version. Thanks for letting me know, I've added the www. although I expect that PagePlus will fix the broken link eventually. So let me get this straight, if I go to the apple store and buy an unsubsidized unlocked iPhone 5, I can use it on Talk For Good, The Next G, and if I'm lucky maybe Page plus? No, no one has found a way to use an unlocked iPhone from the Apple Store on any US CDMA opperator. You can use a Verizon iPhone 4 or 4S on Page Plus, Talk For Good or Next G. The Straight Talk iPhone 5 may also work. I see... How about using an iPhone 5 on T-Mobile's $30 5gb plan? Will I be able to get 5gb of "4G" speed before being throttled or do I have to be in one of those select cities that have been re-framed to be "iPhone friendly" to get high speed data? The Verizon iPhone 5 will not activate through the PagePlus dealer portal from what I have read. The SIM slot is unlocked, so you could use a Verizon iPhone 5 on Tmobile or AT&T for now (no LTE). You need to be in one of the 47 Metro areas that have been refarmed to get 3/4G on the 1900 MHz channel. I read the forum and it looks like a good deal if you're lucky and it works. But say I tried that and I'm a proud owner of an iPhone 5 on Page Plus and (scenario time), lets say something surreal happens like... AT&T lowers data rates for it's mvno's and actually makes data relatively affordable. And now I want to switch to a AT&T mvno, could I do that? The GSM side of the Straight Talk iPhone 5 is unlocked and it will work on AT&T MVNOs. Nice! Well I don't see why someone wouldn't get the straight talk iPhone 5 from Walmart and at least try and get it on a Verizon mvno and if all fails you can still use it on a AT&T or T-Mobile mvno. Yeah I was afraid you would say that. It looks like I'm stuck using Consumer Cellulars $35/mo. 150min, 4000texts, and 400mb of data till T-Mobile gets their act together. Thanks for clarifying though. 1. GoPhone $25 plan with 250 min, unlim texts and $25/$5 data option. 500mb/month for $40. Less than Consumer, since you will not pay postpaid taxes. 2. AirVoice $40 Unlim plan + 500mb. Less than Consumer; no taxes. 3. PureTalk Unlim+, $44/month for unlim + 600mb. Not much more than Consumer, since you won't pay postpaid taxes. "If you are on our Pay-as-you-Go or Data only plans, you cannot use MMS. When your current plan expires, upgrade your plan so you may take advantage of the IM feature." Does this mean that the data option is not available on PayGo? If you have the $10/month data addon MMS should work. I checked with NextG CS in TX, "Please tell me whether I can use the $10, 250mb data option with the Pay-Go service plan." "The $10 - 250mb Add-On can only be added to a $40 Voice and Text plan or higher... Thanks"
You may want to update the Pay-Go table above, NextG data column. Thanks for letting me know. I've updated the table to indicate that there's no data on the NextG pay as yo go plan. I currently use an iPhone 4S on Page Plus Cellular $55 plan with 2GB data, and haven't ever had any issues with it. The only thing that doesn't work is Visual Voicemail, but I downloaded an App that supports VVM, which works flawlessly. 3G data worked off the bat, as well as MMS, incoming & outgoing. The plan comes out to $58 per month with tax, and is about $50 cheaper than Verizon wanted to charge me to use my 4S. Also, at time of activation it had a Bad ESN from having a past due balance, but exclusivecellular.com activated it for free, knowing that it had a Bad ESN (well, i'm not sure if they knew, it was just a form on their homepage that automatically activated it). A lot of people say Bad ESN phones can't be activated on Page Plus, but I had gotten it shut off about a week before they activated it. I got an e-mail like 2 minutes later and all I had to do was *228 to get it working. I know Tracfone and Net10 don't require a credit card to purchase minutes or activate a phone. Could you tell me please if PagePlus or Talk for good, requires a credit card? It's much better for me to use cash, paypal, or Amazon which takes it out of my bank account. Thank you in advance for your help. I know Amazon takes paypal. Dennis, Just wondering if you still use a portrait-Qwerty keyboard, and if so would you mind sharing what one you use? I'm curious because I'm looking for a portrait qwerty keyboard style no contract phone. Thanks! I currently use a touchscreen Android phone. I've owned three portrait QWERTY phones. I liked the keyboards on the Nokia E71 and Pixi Plus. I rate them roughly equal. The other QWERTY phone was a Nokia Asha 303. I did not like the Asha's keyboard at all. Lots of typos with that one. Keyboards with prominently rounded keys like the Pixi's seem to work the best for me. Talk for Good is selling phones now, and has low prices on a variety of feature phones and low-end smartphones. E.G., New Moto Citrus for $70 and Kyocera Milano for $80 have one-year warranties. Refurb "A" LG Vortex for $98 and Ally for $127 have 90-day warranty. Talk for Good's plans pay has been down for maintenance for at least a day now. I wonder what's happening with their plans? Lots of complaints on this blog about no Verizon LTE with MVNOs. There are a lot of people who talk a lot at night and on weekends who could take advantage of the "secret" Verizon $70 plan* with 2GB of LTE. iPhones and Android phones welcome. No, it's not prepaid. Tracfone PAYGO Plan: Note 1 should be changed to Note 2, Non-Smartphones only, unless you update that footnote for the new Tracfone smartphone. I've fixed the footnote and updated the post to include TracFone's new Android phones. Thanks for letting me know. I have a Blackberry that I purchased from Straight Talk last year - that I am no longer using. It used to run on the Verizon network. Can I use this Blackberry phone (Curve 9310) with any other Verizon MVNO? We don't need any data - just as long as the phone and text works we are good. Actually looking for a good pay-as-you-go plan from a Verizon MVNO. Your best bet is probably Page Plus which has free activation that includes an initial $2 credit if you activate through a dealer like Kitty Wireless. I'm not sure if it the Straight Talk BlackBerry will work but some of the Straight Talk Android phones have been successfully activated on Page Plus. For the simpleton who has an iphone on the verizon network, it was a gift from a friend who no longer uses it, what would be recommended as the EASIEST and QUICKEST way to reactivate the phone as prepaid with a new number???? Thanks for the info!!! Only the Verizon iPhone 4 and 4S can be activated on prepaid. The iPhone 5 and latter can't be activated on any Verizon based prepaid plan. The iPhone 4 and 4S can be activated on Verizon Prepaid or any of the MVNOs listed above. Verizon Prepaid is the easiest, with the best support although it's not the least expensive. To activate your iPhone on Verizon prepaid go to activate online at http://www.verizonwireless.com/activate or calling (800) 294-6804. Not for phones. Millenicom does for mobile broadband. Does Verizon Prepaid still charge an activation fee? There's a $35 activation fee if you buy a Verizon Prepaid phone from a Verizon store or the Verizon website. The fee is currently waived when you buy a smartphone on the Verizon site. There's no fee for activating a new or used Verizon phone bought from Wal-Mart, Target, RadioShack, Ebay, Craig's List etc. Hi Dennis, first, thanks a ton for the amazingly information packed and well-maintained site on prepaid wireless. It is easily one of the best topical sites on the web! My question is about this: 'Page Plus allows tethering on all plans.' Does this still hold today, especially after American Movil's acquisition of PP? Also, how likely is that VZW would start allowing LTE data speeds on PP as well as its own prepaid plans in the near future? PagePlus terms of service do not probit tethering and I haven't heard of PagePlus taking any action against users who tether. Most Verizon handsets have hotspot and tethering disabled in the phone's software so you need to install a hotspot or tethering app which will require root or jailbreaking on some phones. Every month for the last couple of years there's a new rumor that LTE is coming to Verizon MVNOs in a week or a month. It will happen when it happens, could be a next week, next month, next year or three years from now. I don't know if you can but a competent flasher can flash most Sprint phones to PagePlus, Selectel or BYO but not REdPocket, NET10, StraightTalk or Tracfone. You won't have LTE of course. Does anyone know if I can use a Sprint phone on a Verizon MVNO without changing the software on the phone? I was wondering if I just install the PRL file and program the phone number on the phone if that would work? I do have the MSL. Just two stupid questions. What is the SID and can I get data working just by changing the username and data settings ? Disclaimer, I'm not a flasher, what follows is what I've been able to gather from incomplete instructions and comments by flashers. It's incomplete and possibly wrong. Errors in flashing can easily brick a phone. Unless you have way more time than money I recommend paying the $30 or $40 that flashers charge. To get data working you need write unique keys to the phone. The keys are generated from your MEID and MDN by a secret algorithm that know one outside of Qualcomm has or at least is willing to share. Most flashers get the keys by writing the target phone's MEID to a Verizon donor phone (the MEID is the phone's unique serial number and changing it may be illegal), activating the donor, retrieving the keys and writing them to the target phone. I see what you mean about getting data to work. Last question where do I find and change the SID on the phone? Do I also need to change the NID (what is it BTW) and why do I have to change the SID just for talk and text if the phone is in the same location ? And can I switch the phone back to Sprint if I need to? You might not need to change the SID manually. I programmed my Sprint Moto K1m MDN and MIN for a Verizon MVNO number I had activated. The SID was changed to the Verizon SID in my area when the phone connected to the network and I locked it in digital roaming mode to Vzw. On my Sprint phones, I see my SID by visiting: Settings>Phone Info>Advanced. Just look through your menus. Yes, you can change back to Sprint. Just activate the phone with a Sprint operator and the phone should autoprogram. If not, use your MSL code to manually program or reset the phone. I think I found the SID under data settings but the number there is only 4 digits is this the right one? I also found something called the NID and this one does have 5 digits do I change this one as well? And if I program the phone for a Verizon MVNO will there be any problem going back to Sprint? SIDs can be less than 5 characters. Just enter whatever the Verizon SID for your area is. I haven't heard of anyone changing the NID. I'd leave it alone. To go back to Sprint you can do a factory reset or data reset and Sprint hands-free activation should automatically run and re-program the phone. Plans aside are there any differences in service between Straight talk and Net10? I've heard Straight talk is more strict then Net10 about data use is this true? I don't believe their are any differences between Straight Tak and NET10 other than distribution, pricing and the amount included data. Do NET10 and Straight talk block video streaming? No they don't block streaming. But some users have reported being throttled after streaming even though they hadn't used up their high sped data allotment. Both, they are the same company, same service. Until the end of the current plan month. Are there taxes and fees with NET10 and Straight Talk? applicable sate and local taxes and e911 fees including the e911 fees that are collected directly from the operator rather than from the user. You can avoid the USF, regulatory cost recovery fee non-point of sale e911 fee by purchasing airtime cards or PINs from local stores or from Walmart for Straight Talk. You can avoid all taxes and fees on NET10 by purchasing PINs from online sellers like CallingMart. What's the difference between coverage on Selectel and PagePlus? Selectel doesn't charge for roaming on the Verizon's Extended Network, roaming on Page Plus is 29 cents/minute. Does any other MVNO do the same? Dennis: You are only correct if you are referring to The 12 plan on PagePlus. Roaming is listed as 20c/minute on other plans from $29.95 to $69.95 (unless PagePlus made a typo on all of those plan details pages). Roaming also costs 29c/minute on PagePlus Pay-Go plan. "Does any other MVNO do the same?" There's no extra charge for roaming on Verizon with CDMA feature phones on TracFone and NET10 pay as you go. "Dennis: You are only correct if you are referring to The 12 plan on PagePlus. Roaming is listed as 20c/minute on other plans from $29.95 to $69.95 (unless PagePlus made a typo on all of those plan details pages)." Tree, except that roaming is also 29¢ on the PagePlus PAYGO plan. What about NET10 unlimited plans? 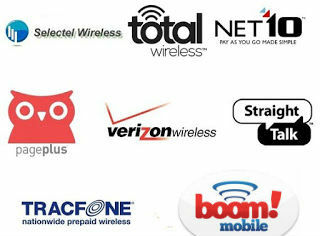 PagePlus has Verizon prepaid coverage and Tracfone has Verizon postpaid coverage is that right? Page Plus and Selectel have the same coverage. But off network roaming is free on Selectel and 20 or 29¢/minute on Page Plus. Do Verizon based NET10 and Tracfone smartphones include roaming? There's no roaming with NET10, TracFone or StraightTalk Verizon based phones. Congress passes phone unlocking law. Does this mean prepaid phones sold in stores have to be sold unlocked from now on? No, the law legalizes cell phone unlocking by individuals and businesses. It doesn't require that phones be sold unlocked. Are unlocking services now legal? Yes, the new law legalizes unlocking services. Will the new law increase or decrease the cost of an unlock code? That's impossible to say but I don't think it will have any effect on prices. It will increase demand but supply should also increase as mainstream sites like Amazon will probably start selling unlocks. Do phones bought from PagePlus work on other Verizon MVNOs? They used to work on Selectel but I'm not sure if they still do now that Selectel and all the other MVNOs can only activate Verizon phones. Did PagePlus phones ever work on Straight Talk? As far as I know, never. Are the phones sold by PagePlus new or used? At the moment all the phones on the Page Plus site are new except the LG Optimus Zip which is refurbished. PagePlus always labels their refurbs as such. Are Tracfone triple-triple smartphones allowed on their 30 day value plans? If Verizon isn't allowed to sell their LTE phones locked does that mean Straight Talk also won't be allowed to sell Verizon based LTE phones locked? Maybe, Straight Talk's iPhone 5 is unlocked. It's a Verizon iPhone that's modified to disable LTE. I've heard that CDMA phones have poor call quality indoors I know this is true of my Sprint phone. On the other hand my GSM (AT&T) phone sounds great indoors. Do Verizon phones also have poor indoor call quality like Sprint phones do? Call quality has been excellent on my PagePlus phones. Poor call quality on Sprint is likely due to the Sprint network being overloaded in many places. I'm not aware of any inherent voice quality superiority with GSM. Can Verizon LTE and XLTE phones use voice and data at the same time? Verizon Android phones support simultaneous voice and data when connected to LTE (including XLTE), iPhones do not. Is the data overage on the PagePlus $12 plan priced at 5c/MB or 10c/MB? Can data be added to the BYO $5 plan? You can add data to the BYO $5 plan bu purchasing an add-on package; $5 - 100 MB, $10 - 250 MB, $15 - 400MB. Add-ons expire after 30 days there's no roll-over. Does any Verizon MVNO offer unlimited international calling? Straight Talk, NET10 and Telcel America do with one of their Verizon network based phone's and an international plan. As with all unlimited international calling plans you are limited to which countries you can call. With Straight Talk, NET10 and Telcel America you are also limited to calling no more than 15 different international numbers each month. For how much longer is Verizon prohibited from locking their LTE phones? Verizon LTE phones are not locked. You can use the one's with GSM capabilities on T-Mobile or AT&T. If you are referring to Verizon blocking their prepaid phones from being used on Verizon MVNOs that's not because the phones are locked. Verizon blacklists the prepaid phones by their serial number. As far as I know there no current or proposed law that would prevent them from doing that. My question is how much longer is Verizon not allowed to lock their LTE phones? Not locking their devices is part of the open access requirements that the FCC imposed on the the use of the 700 Mhz C block LTE spectrum that Verizon won in the 2008 LTE spectrum auction. Those rules are permanent and have no expiration date.Verizon sued to have the rules overturned but eventually dropped the suit. They could sue again but unless they do and win the open devices requirement is permanent. Does that mean Verizon MVNOs aren't allowed to lock their phones either? Not currently because the rule only applies to LTE phones and Verizon MVNOs don't have any. I don't know have the legal expertise to say if it will apply to the MVNO once they start selling LTE phones or not. I think it should because the phones will be using the C block. I think you've said before that T-Mobile works better than AT&T in San Francisco. How does Verizon compare? Between AT&T, T-Mobile and Verizon which works best in San Francisco? Verizon most of the time. Are Verizon and T-Mobile the best options in San Francisco? How bad is AT&T over there? AT&T is OK if you have an LTE phone, 3G and 4G HSPA+ seems to be overloaded and slow sometimes but LTE is usually good. Does Telcel america offer service on Verizon now? Telcel America used to have some Verizon based phones and a Verizon CDMA BYOP program but they seem to have discontinued both phones and BYOP. The Telcel America site currently only offers T-Mobile based SIMs and phones. Why isn't Puppy Wireless listed in this post? They offer 1GB for $30/mo on Verizon. All of the other Verizon MVNOs only offer 500MB at that price. Although anyone can sign up for Puppy now, it's still seems to bevery much in the testing phase. The official launch is supposed to happen next month. I will be covering Puppy as it launches but I think it's premature ti include it in the Verizon MVNO comparison until Puppy plans, pricing and features are stable. "All of the other Verizon MVNOs only offer 500MB at that price." RedPocket will sell you 1GB for $19.99/month. Puppy announced on the Forum there will be AT&T and Sprint plans, too. They "loaded them on the platform." Why does the table have two "LTE available" notes? My sloppiness. There's no difference between the two. The table is missing Straight Talk's $60 international plan. Dennis, there's a new Verizon MVNO from America Movil called Total Wireless, their plans include a $35 2.5GB plan, 2 lines with 5GB of shared data for $60 and 4 lines with 12GB for $110, there's also a $25 talk and text plan. Users can also add 1.5GB of shared data for $10 and unused data add-on's never expire. Suggestion: Net10 has new, interesting plans that are not shown on the table. New Tracfone Verizon-based MVNO call Total Wireless sold exclusively through select Walmart locations. BYO's $5 and $10 add-on's no longer offer voice minutes and the $5 add-on includes 1,000 texts, instead of 100. Can BYO plans be renewed early? On the PagePlus PayGo plan if an unused portion of a $25 top up with a rate of 6¢/min is about to expire and is renewed with a $10 top up, do I lose the 6¢/min rate and go up to 10¢/min? Don't tell me nobody knows! If you run out of minutes or texts on BYO you can renew early which restarts the plan with a fresh set of minutes, texts and data replacing whatever was left and a new expiration date 30 days in the future. PagePlus PayGo is FIFO (first in first out) The $25 refill was added first so the rate is 6¢/minute until it's used up, then the $10 refill kicks in and the rate is 10¢/minute until the $10 is used up. Will the $10 top up extend the $25 top up's expiration date or will the $25 top up expire and be replaced by the $10 top up with the 10¢/min rate? On Page Plus a $10 top up will make the expiration date 120 days from the date it was added unless the expiration was already more than 120 days in the future (from an $80 top-up) in which case the expiration date would not change. Why isn't Total Wireless listed? The Total Wireless 4 line plan costs $110. The Net10 $50 plan includes 3GB and LTE. The table is missing the Net10 $40 plan. Net10's $50 plan is listed twice. Net10's $40 plan doesn't list a data allotment. Verizon's $35 plan has a typo. Verizon's $45 plan now includes 1GB (1.5GB with autopay). Page Plus was the first Verizon MVNO to get LTE, in Nov 2014. Special programing (aka Flashing) is no longer required to activate a Verizon LTE phone on Page Plus. See Prepaid Operator Profile: Page Plus for comprehensive and current information about Page Plus. Ah, thanks, that's a relief. Also, I know that I cannot take a Verizon Prepaid phone to Page Plus (only a postpaid one can go to PP), but if I buy a Page Plus phone from the PP site, and for some reason down the road I decide I prefer Verizon Prepaid, can I take my Page Plus phone to Verizon Prepaid? Also along those lines, it seems from other reading that I have done in your blogs (thanks for all the extensive info you provide, by the way! ), you say that Verizon no longer is allowed to make locked phones, and therefore Verizon postpaid phones are all GSM unlocked? So if I buy a Verizon postpaid phone, use it at Page Plus, then later decide I want to go to a GSM carrier like Cricket or TMobile or AT&T, will it work perfectly fine? Or will I be tripped up by the fact that I have to worry about all of the frequencies/bands being included/compatible with each carrier I am considering and the phone I get? Dennis, do you know if Verizon Prepaid or any of its MVNO's, particularly Page Plus, offer mobile hotspot? I have scoured their sites and cannot find any info about it. Is there an additional charge if they do? And does the data you use come out of your monthly plan allowance, or is there a separate bucket of data specifically for hotspot use? Also, in your Verizon Prepaid profile, you mention that Verizon Prepaid charges taxes for payments made on Verizon's site or through autopay, but they can be avoided by using Callingmart. But autopay is required to get the additional 1GB of bonus data every month, so is there a way to pay through Callingmart to add funds to your acct, and then they are deducted through autopay by Verizon and you still would get the 1GB of bonus data? Verizon Prepaid allows hotspot on their $45 and $60 smartphone plans. Nost Verizon branded phones block it however so you will need to find a hotspot app or hack that works with your phone. I think all the MVNOs prohit hotspot but check their terms of service to be sure. Verizon Prepaid allows hotspot on their $45 and $60 smartphone plans using included plan data. Most Verizon branded phones block it however so you will need to find a hotspot app or hack that works with your phone. I think all the MVNOs prohibit hotspot but check their terms of service to be sure. Verizon will always use your autopay credit or debit card to renew even if there's a cash balance on the account. I seen reports of people using a prepaid debt card to sign up for auto pay, adding cash with CallingMart to cover their plan payment, then drawing down the balance on the card until it's too low to cover the plan renewal. It's claimed that Verizon will try to use the card to renew, find there's NSF and renew out of the cash balance and the auto-pay discount is retained. Sounds sketchy to me and unlikely to work for long however. I am considering the HTC Droid DNA or the Motorola Droid Ultra...both seem to imply from these sections of Verizon's website that they have mobile hotspot capability. Do they just happen to be exceptions to the blocking that you describe, or am I still missing something, and would I still need a hotspot app or hack? According to Verizon's press release when they launched the $45 plan hotspot should work on any Verizon phone that supports hotspot. ALLSET PLANS - 4G LTE Smartphones. I though I remembered seeing some posts on HowardForums from users who said it didn't work but I can't find them. I think hotspot not working may have been a problem with Verizon MVNOs not Verizon itself. If you try it let us know if it works. Dennis, in your Verizon Prepaid profile, you mention that Verizon Prepaid charges taxes for payments made on Verizon's site or through autopay, but they can be avoided by using Callingmart. But autopay is required to get the additional 1GB of bonus data every month, so is there a way to pay through Callingmart to add funds to your acct, and then they are deducted through autopay by Verizon and you still would get the 1GB of bonus data? It's possible but not easy as Verizon will always try to charge your card for autopay rather than using the credit you added with Cllingmart. The trick is setup autopay with a prepaid debit card like Walmart's Amex Bluebird card which doesn't charge a monthly fee. Keep the balance on the card below your autopay amount. Verizon will try to charge the card and fail and and use the CallingMart credit to renew but still give you the 1GB autopay bonus. Verizon could close this loophole at anytime, of course. The $30 monthly plan has been upgraded to 1500 minutes, unlimited text, and 1 GB of data. The $40 monthly plan has been upgraded to unlimited talk, unlimited text and 2 GB of data. The $55 monthly plan has been upgraded to unlimited talk and text, along with 5 GB of data. Dennis, typo, the table above needs Selected $30 plan 1300 min. to be updated to 1500 min. The table has a few typos. The Envie $45, $55 and $65 plans all list a price of $55. And the Selectel $100 yearly LTE plan lists a price of $86.33/month. Corrected, thanks for the heads up. Verizon and MVNOs will activate the unlocked Nexus 6 but they won't activate anything with the Sprint logo on it. Eco Mobile does not offer a paygo plan on the Verizon network as the table in this post says. You might have been thinking of Expo Mobile which does offer a paygo plan on Verizon. Yes, Total data is hard capped with the option to buy more if needed. In the table, if it doesn't say unlimited, it's hard capped.